Are you a school or organizational leader who is committed to creating a culture of inclusivity, equity, and diversity, but need a little help walking the walk? Don’t worry, you’re definitely not alone. 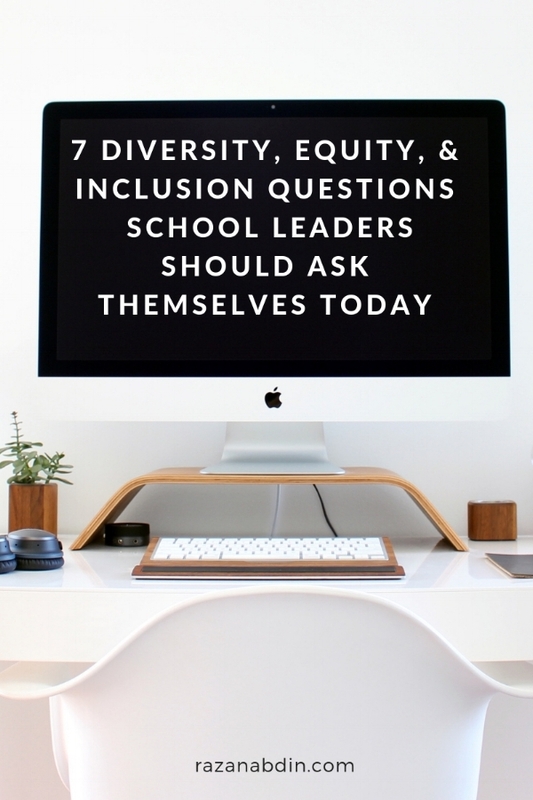 Here are seven guiding questions that we should be asking ourselves as we’re on our journeys of cultivating more equitable schools and institutions. 1. Is my staff representative of the community my school serves? Do we have hiring biases that need to be addressed? Unfortunately, in many cases, the answers to the above questions are NO and YES. We all have unconscious biases (read more about this in the article: Cultivating an Anti-Bias, Anti-Racist Home). Left unchecked, these biases and judgment can (and will!) permeate the entire culture of an institution: from who we’re hiring to how we’re disciplining our learners. This work of unlearning our biases is critical. 2. Are the families and greater community that we serve given opportunities to express their needs, voice concerns, and create school policies accordingly? How does your school or organization approach Family and Community Engagement? All the research suggests that strong partnerships between schools, families, and communities benefit all parties and result in better academic success, fewer suspensions, more regular school attendance, etc. Our new norm should be involving children, families, and the community in the decision making processes in our schools. They deserve to hold positions of leadership. Their needs and concerns deserve to be acknowledged and policies and practices should be shaped accordingly. 3. Do our application & recruitment processes and/or our tuition and fees keep linguistically and socio-economically diverse families from attending our schools in the first place? At the very least, is all of the literature at your school available in all of the languages that might be spoken by the people in the community you serve? If your school is independent, does it offer scholarships and financial support for families who are not economically privileged?These are the questions we must ask ourselves if we’re genuinely interested in building schools that are economically, racially, and linguistically diverse. 4. To what extent is the school I lead truly inclusive of all students, families and staff, this includes, but is not limited to: families who belong to a religion besides Christianity, people who are differently abled, LGBTQIA, people who are economically marginalized, BlPoGM (Black, Indigenous, People of the Global Majority), etc.? Are non-Christian families expected to participate in Christian-centric holidays or celebrations? Are their respective cultures represented in your school from the books you read to posters that fill your hallway walls? Are the bodies of children of color policed at your school (this includes being sent home for their natural home or being disciplined more frequently and more harshly)? Are our schools built with principles of Universal Design in mind? Are they accessible to folks who are differently abled? 5. Are my school’s discipline policies consistent with our school’s mission? Do we employ punitive or restorative approaches? Are your policies regarding discipline consistent with research on child development and best practices? Do your practices punish or teach? Do they preserve the dignity of every single child you serve? Curious about why I’ve chosen to talk about discipline in a post about equity? If so, read this. 6. Do I support my faculty and staff in their efforts to lead anti-bias, culturally responsive classrooms? Is my staff given the support they need on their anti-bias journey? This might look like hosting a school-wide book/article reading club where participants can learn and ask questions, hiring a consultant to lead a series of workshops/trainings, provide ongoing coaching support, etc. It will require consistent and sustained effort. It will be so worth it. 7. Am I holding myself accountable for growing more in my own anti-bias, culturally responsive journey? Now you’re actively encouraging your employees to progress in their anti-bias, culturally responsive journeys (and, hopefully, providing the necessary support), but are you also making every effort to confront your own biases, to look at your own praxis through a critical lens, and make alterations accordingly? 8. Does this look like love and liberation in action or does this mimic oppression and maintain the status quo? This transformation will take time. We cannot change school or organizational culture quickly or effortlessly, but that doesn’t give us a pass to stop doing the ground work today. I wish you patience, strength, and success on your journey to creating the equitable, liberatory, love-filled schools that our children, families, and communities deserve. Which of these guiding questions resonated the most with you? What is the first step you will take to cultivating a more equitable school? Let me know in the comments below. Join our mailing list to get free resources delivered right to your inbox! I n t e r e s t e d i n l e a r n i n g m o r e ? Join us for our upcoming webinar!